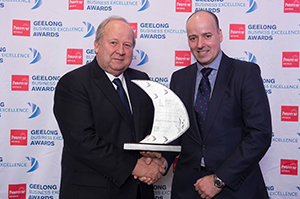 The Southern Star Group is elated to have received the award for Advanced Manufacturing, Research and Development at the 2016 Geelong Business Excellence Awards. The Geelong Business Excellence Awards is an annual event that recognises excellence in the regions business industry. Several categories highlight the diversity and capabilities of the regions businesses, including small and home businesses through to large-scale organisations. The Southern Star Group was also commended on being a finalist for Business of the Year – the night’s ultimate award. A pool of over 60 businesses provided competition for all categories and it is an honour not only to win a category, but to also be named as a finalist for the top prize. This achievement follows the recent recognition of the Southern Star Groups Canterbury Showroom, which was awarded Showroom of the Year from the Australian Window Association last week. As a proudly Geelong based business we are happy to be recognised for the dedication, diligence and success we achieve in the local community and nationally. Congratulations to the team on the stellar performance and achievement!